McHenry's Peak turns a brilliant red as the morning sun illuminates the granite peak deep within Rocky Mountain National Park. Black Lake is still as glass this morning, allowing for McHenry's Peak a perfect reflection in the clear waters of Black Lake. Black Lake is located deep within Glacier Gorge. 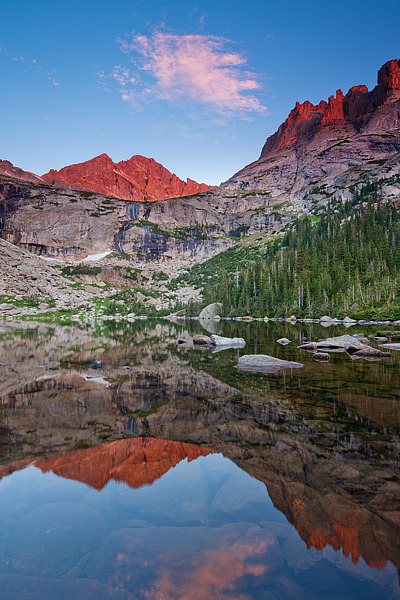 The area around Black Lake contains some of Rocky Mountain National Park's most impressive peaks and beautiful locations. Photo © copyright by Thomas Mangan.